The Secret Life of Walter Mitty is James Thurber’s classic story of a day-dreamer who escapes his anonymous life by disappearing into a world of fantasies filled with heroism, romance and action. When his job along with that of his co-worker are threatened, Walter takes action in the real world embarking on a global journey that turns into an adventure more extraordinary than anything he could have ever imagined. We saw The Secret Life of Walter Mitty in the theater yesterday. It wasn’t one that I had on my must-watch list, but we wanted to see a movie and it seemed like something we would all enjoy. I’ve never read Thurber’s story, but it doesn’t seem like it really has much to do with the movie anyway, aside from featuring a day-dreamer. I’m not a Ben Stiller fan either; I tend to find his comedies on the stupid side. So, I didn’t have much expectations going into the movie, but it turned out to be fun. The movie’s message is pretty simple: Get out and Live. Take Chances. Don’t just Dream about Life, Live it. It’s not novel, not ground-breaking but still worthwhile. Walter needs a push to stop day-dreaming and a problem at work provides it. Walter goes on a global search for a photographer because he needs a missing negative. It’s a little flimsy for a set-up but it worked for me. And of course, there’s a girl who he wants to impress and who most of his day-dreams revolve around. The scenery is gorgeous and Walter meets some interesting characters on his journey, including deck hands on a fishing ship in Iceland, a hotel owner in Greenland and a couple of “strong, small men” in Afghanistan. It didn’t make me want to embark on an adventure, adventures look dirty and smelly, but I like the concept. Stiller surprised me. He didn’t annoy me, I found his Mitty cute, in an awkward way. I was rooting for him. But I didn’t get too attached to the characters, which I think is a good thing, but is one of the negatives you’ll see in a lot of reviews. I watched the movie, without being really pulled into it, which is probably why I wasn’t crying at the slightly cheesy ending. Mind you, I don’t want to cry at a movie, I tend to avoid ones that I know will leave me in tears, but I felt pretty safe with the PG rating. 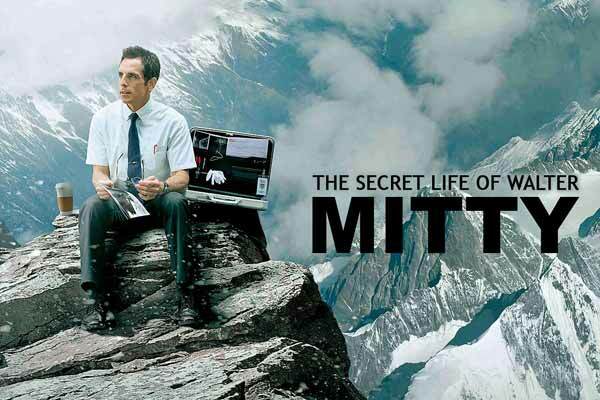 Watching The Secret Life of Walter Mitty was a nice way to spend a Sunday afternoon. Now, I need to read the story. I’ve seen the trailer for this one several times and have wondered about it. It sounds like it’s worth seeing.